I understand that RAM is connected directly to the CPU via a high bandwidth bus, and SSD is a peripheral, but my assumption is that there are also electrical design differences (e.g. memory cell design and layout) that make RAM faster than SSD for reads/writes. If that is true, and with bus bandwidth & latency differences aside, what are those design differences, and how do they affect speed? The biggest difference is that SSDs are based on NAND flash cells with the serial structure shown below. Where DRAM accesses all of the bits in a row at the same time, NAND flash serially accesses the row. This significantly slows down read access versus DRAM. Write access is significantly slowed because flash uses a floating gate which requires orders of magnitude more programming time than the capacitor in a DRAM cell. In most cases, since the write can only set a bit to 0 and erasing is required to set a bit to 1, writes also require erasing before programming. DRAM writes can set either state with no speed penalty. Their physical structure is totally different. 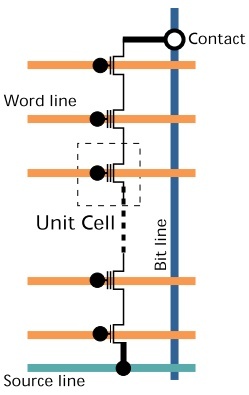 DRAM cells are based on a capacitor holding its voltage. Flash is based on a floating gate design, where the physical properties of the cell changes with a write. Not the answer you're looking for? Browse other questions tagged memory ram dram ssd or ask your own question. Why do dual-rank DIMMs have twice the bandwidth of quad-rank DIMMs? Does a CPU completely freeze when using a DMA?